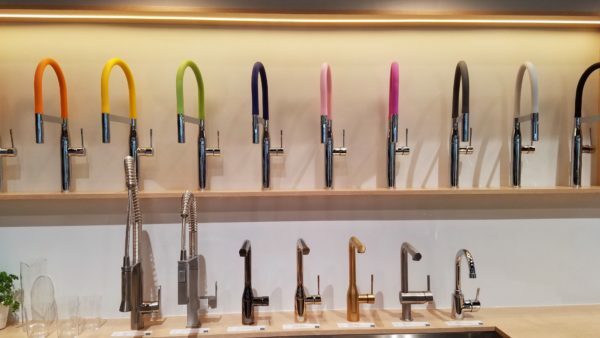 Want to know a bit more about what I discovered in Las Vegas at the Kitchen Bath Industry Show (KBIS)? 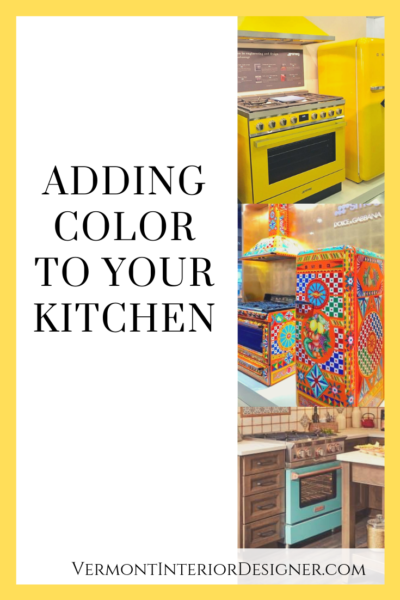 Well, color was everywhere: cabinets, sinks, faucets, appliances and more! Bold colors in a range are nothing new but the variety of options – in the number of color options and the quantity of manufacturers offering color – is quite new. 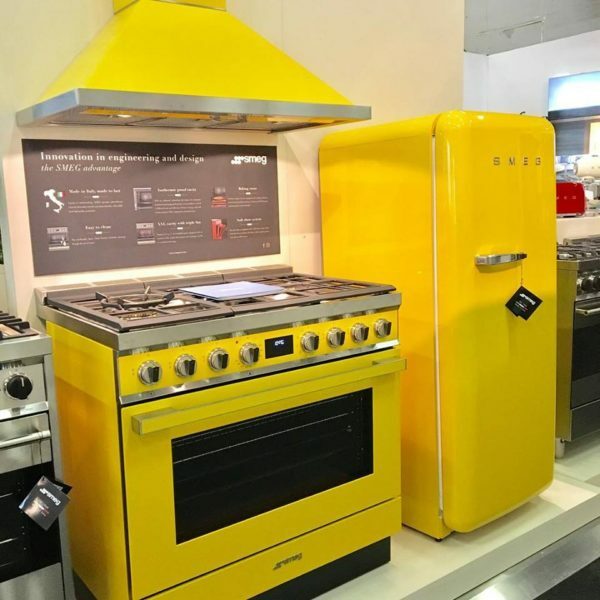 Smeg displayed an entire suite of appliances (hood, stove and refrigerator) all in this dynamic yellow. Of course there were a fair number of “standard” appliance colors. Stainless, black and, surprisingly, white appliances are making a comeback. 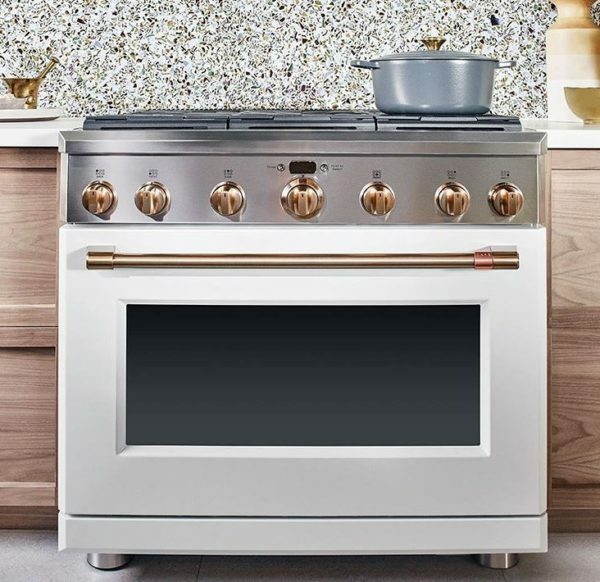 This range is from GE Cafe and has a high-end look, but is GE’s mid-range line. You can mix and match knobs and handles to completely customize the look. This colorful vignette was probably the most photographed. Smeg collaborated with fashion designers Dolce & Gabbana to create a suite of appliances. 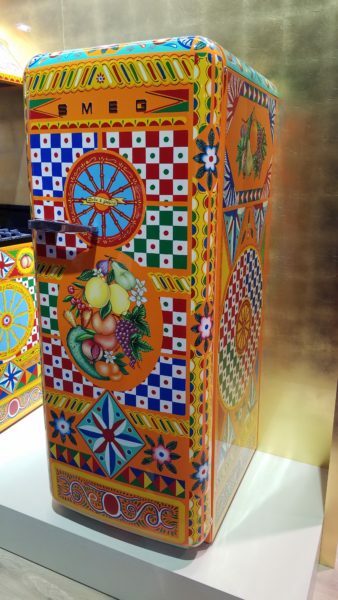 This refrigerator is hand-painted and costs $50,000! Sicily was the inspiration. Smaller appliances in this line (not hand-painted), like toasters and blenders, can be found via retailer Williams-Sonoma. Imagine making your morning smoothies in a blender this fun and colorful. If you’re planning a kitchen renovation and want to use color, schedule a consultation and we’ll show you how to introduce color while keeping the design timeless.